On its sixteenth birthday, Eminem's "8 Mile Soundtrack" finds the rapper at the top of his game. 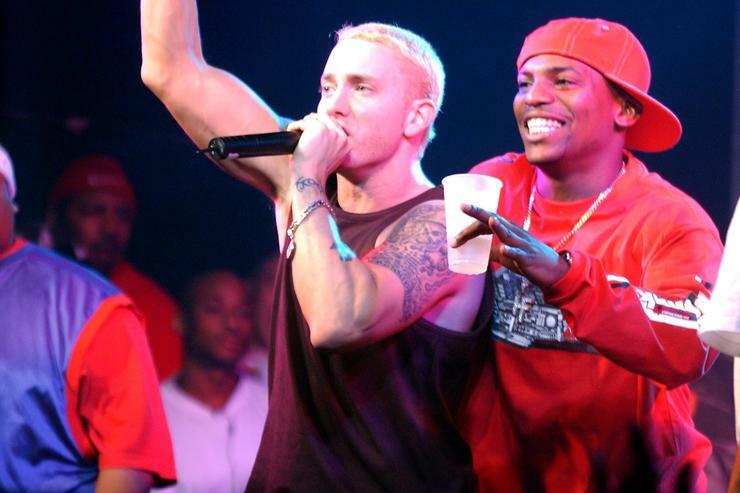 In 2002, Eminem was recently coming off TheEminem Show, which originally dropped on May 26th. Though many deem The Marshall Mathers LP to be the rapper's crowning achievement, others feel that The Eminem Show holds the title. After spending years as America’s villain, Em spent his third studio album in a reflective state, forsaking his piss and vinegar approach for a more collected, self-analytical approach. Flaws and all, Em put himself under the microscope for a welcome dose of character development. If the 8 Mile-era found Em at the height of his popularity, it’s only because his work on The Eminem Show widened the scope of his fanbase to include the parents who once reviled him. On October 29th, 2002, Eminem released the official 8 Mile Soundtrack on Shady Records, at the arguable onset of Shady Records’ dominance; of course, Em himself was thriving, but 50 Cent and Obie Trice were still waiting in the wings, with respective bangers Get Rich Or Die Tryin and Cheers yet to arrive. In that sense, 8 Mile felt like a precursor, a passing of the torch. Looking back, it feels like Eminem was at the height of his craft, particularly as a songwriter. Such is evident upon hearing singles like “Lose Yourself” and “8 Mile,” two of the album’s thematic centerpieces. Not to mention, the effortless charisma evidenced on "Rap Game" and "Love Me" speak to a sense of veteran experience inherently absent on his earlier work. Deliberately void of Dr. Dre’s presence, the 8 Mile Soundtrack was Eminem’s brainchild. As such, his contact list was utilized accordingly, bringing collaborators Jay-Z, Nas, 50 Cent, Xzibit, and Young Zee into the fold. The legendary Rakim came through to provide an Aftermath presence, while the late Guru captured the spirit of Battle Rap over DJ Premier’s iconic production. Looking back, the tracklist boasts a stacked roster of contributors, setting a benchmark for the subsequent hip-hop soundtracks to come. With Kendrick Lamar’s Black Panther earning critical acclaim, and Mike WiLL Made-It’s upcoming Creed II likely to follow suit, one has to wonder whether both parties looked to Eminem’s example for inspiration.